Leah Cunningham and Lassa Lhopitallier enjoying all the benefits of the new McCambridge's app. The app allows customers to order and pay for their soup and/or sandwiches to collect in store. Photo: Boyd Challenger. 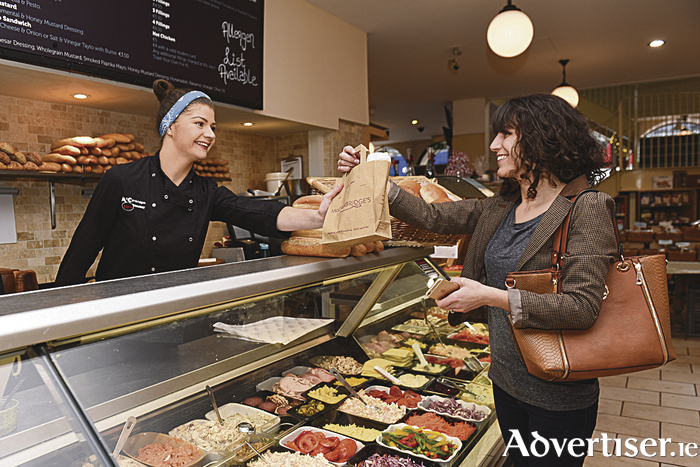 McCambridge’s on Shop Street is a name that is synonymous with Galway and great food in the west. One of the city’s busiest deli counters is making life a little bit easier for customers with the launch of its new app. The McCambridge’s app allows customers to order and pay for their soup and or sandwiches and then simply visit the store to collect. It also offers an extensive range of accompaniments such as drinks and fruit. Opening its doors in 1925 as a ‘high class grocery, provision, wine and spirit establishment’, the grocery has evolved into a food hall, restaurant (Upstairs at McCambridge’s ), and is home to some of the best Irish whiskey, Scottish malts, brandy, liqueur, rum, gin, and vodka. Today McCambridge’s is a leading light in Galway’s culinary scene, the grocery has been transformed into a food hall that is home to local artisan foods, speciality coffee, and organic fruit and veg, along with hand-picked boutique wines.